Well I'm finally DONE with the bathroom renovation!! I can't tell you how happy I am to say that! I felt like this one went on for.e.ver. You may remember when I got a wild hair back in March and started the renovation by knocking down a wall one day. I guess it hasn't even been four months though, not nearly as long as it felt like. ;) Today I'm sharing before and after pics and later this week I'll do a recap of all the projects and share all of the sources as well. So stay tuned for that! 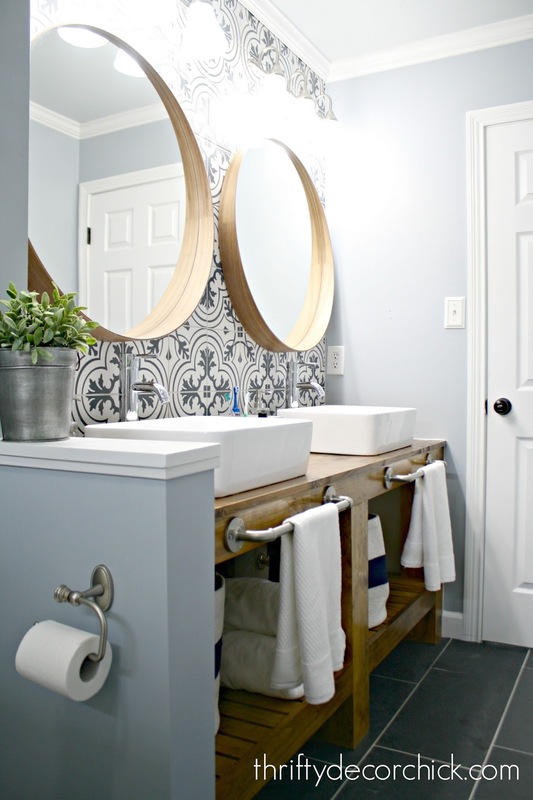 I had this vision of an open wood vanity and that tile wall all along and it turned out even better than I hoped. I adore that wall. Such a statement! You can see I didn't go with a wall treatment like I planned -- I just thought it would be too much with the tile in the room. I didn't want it to get too busy. It is SO much bigger! 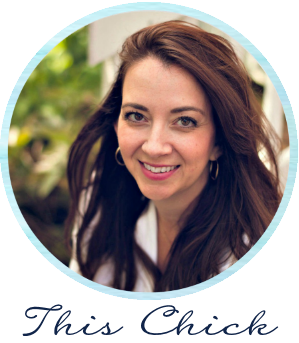 And I'll share the resources for everything else on Friday! It is beautiful and I'm over the MOON it's done! **Here is the post I promised with links to projects and all of the sources! WOW! WOW! this is truly amazing. Such good changes!!! In love! WOW doesn't due justice and those tiles! Can't stop smiling! It looks amazing Sarah! You should be super proud. Best job of updating a bath that I have seen so far. Just-Amazing! Love the tile wall!! So in love right now! The mirrors, vanity, towel bars, just wow!!! Beautiful job! And huge kudos for doing most of the work yourself. I'm impressed! Gorgeous! 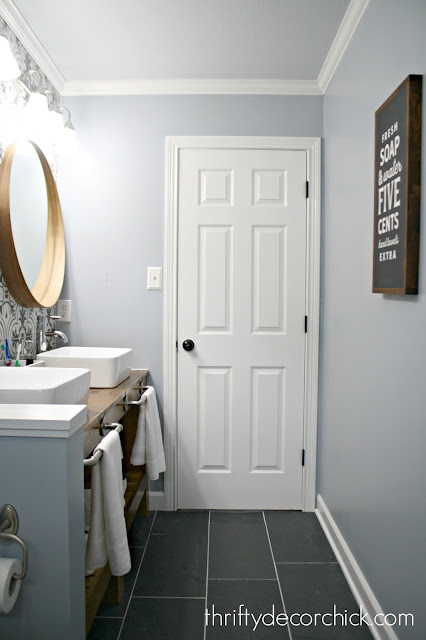 I love that you kept the one wall just paint to let the tile feature behind sink and wonderful wood vanity shine. PERFECTECTION!!! Looks wonderful. I am curious about your towel bars. You have every right to be so proud of this room because it's just fabulous! I do have an odd question - what does the floor look like that adjoins the room (hall to bathroom?). We just had all our carpet pulled up and put down Pergo wood laminate everywhere except the bathrooms and laundry room. We want to do something simple and easy but am not sure what would look best next to the wood look floor. 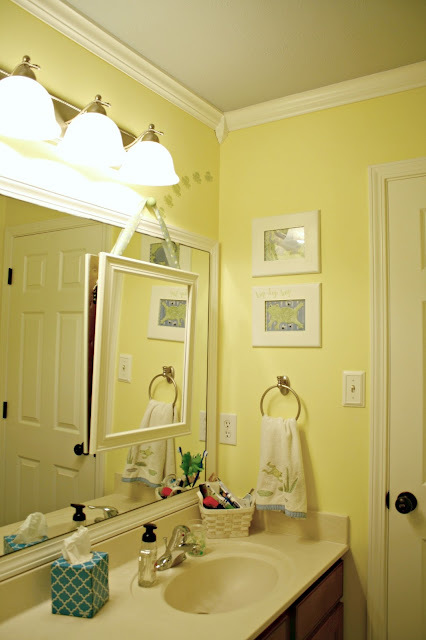 It looks like you went from one light fixture to two above the vanity. Did you do that yourself or get an electrician to do that? I'm wanting to do the same in our master. It really is fabulous. Great job. I see you went from one sink to two. I have a set up similar to that and just wondering how hard that was to do. I would also need to add a second light fixture. Love the work you've done. AMAZING transformation! Love it all! 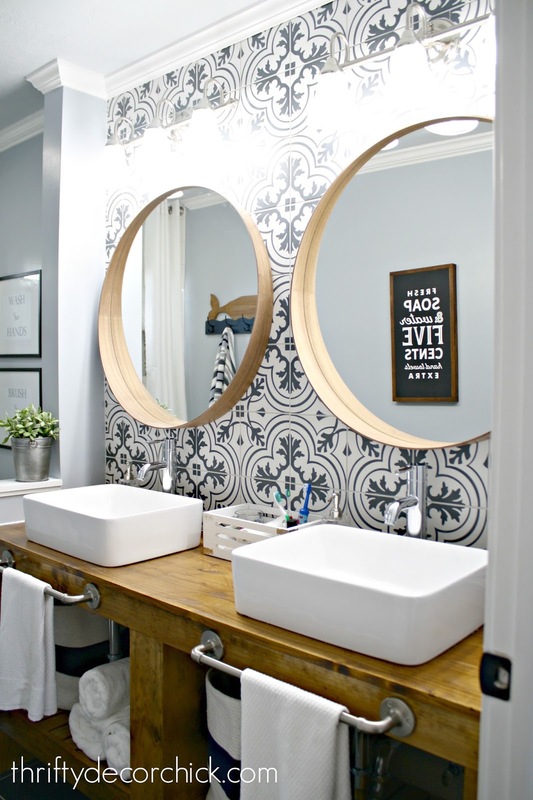 your bathroom reno is stunning. congrats. well done. Could you give your reasoning for choosing a 1/3 offset pattern for the subway tile instead of a running bond pattern? I'm trying to make a decision for my own installation. I did the 1/3 on the floors as well so wanted to keep it consistent. For bigger tiles like on the floor the 1/3 is recommended, just in case things go off just a bit. Super duper awesome job!!! Can't wait to read all about it, as I'm just about to demo the boys bathroom and try my first DIY reno, so I'm REALLY excited to see how you did it all!! Wow!!!! I love that proud feeling of knowing you created something this beautiful by yourself! Wow! That is one incredible transformation. It is absolutely gorgeous. 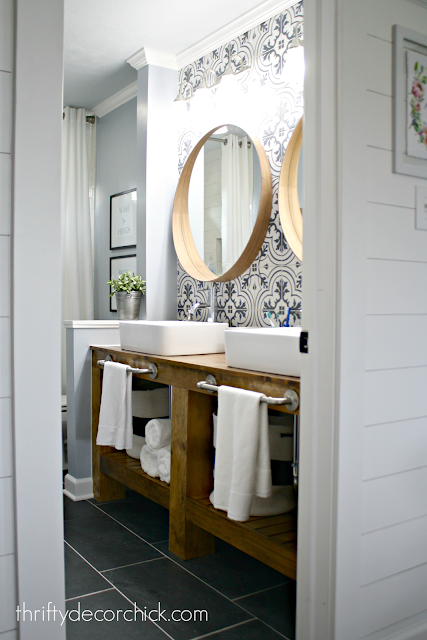 Kudos on your vision, execution and all the hard work you put into this spa-like bathroom. You deserve to be extremely proud. Gorgeous!! Love the tile! LOVE THE VANITIES!!! Need to know the paint color! Can't wait for the follow up post! Great job! Everything about this is beautiful! 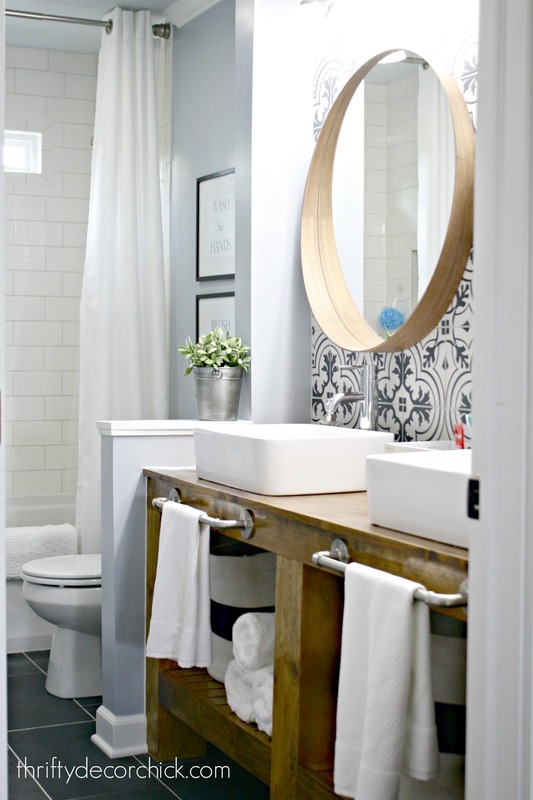 I love the details like the beautiful mirrors, the towel bars on the front, and the stunning statement wall-it's definitely bathroom goals! Wow! This is just stunning! 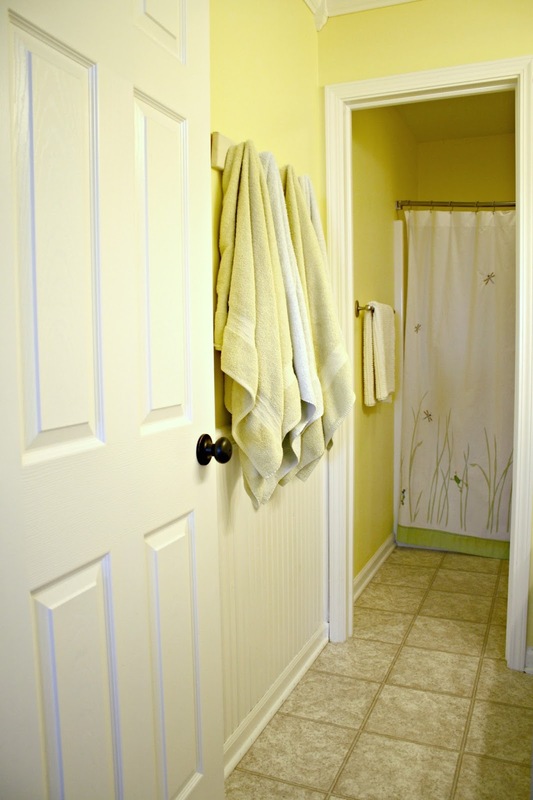 You did a fantastic job renovating your bathroom. Pinning! This room is awesome!!!!!! !.....for many reasons: 1) I love everything about it. 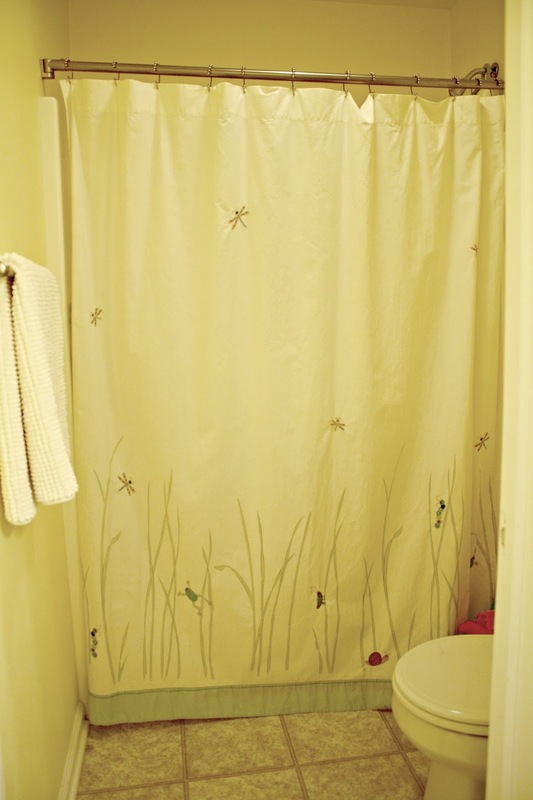 2) My son's bathrooms upstairs looks JUST like the before pictures and I have always hated it, and 3). I plan to use this exact format if I redo his room. I absolutely love this, and it would work perfectly. Please give detailed instructions on the vanity please. If it was a diy, please provide detailed instructions as I have been looking for one like this and want to recreate it. Thanks for everything!!!! Stare at your room then get some rest. You deserve it!!!! Holy crap, the difference is phenomenal! I love it! This room is beautiful!! I would love a tutorial on how to build that vanity! That is absolutely gorgeous!!! It doesn't even look like the same room. I'm envious of your talents!! Now I'm inspired to do our master bath with a vanity like yours. Great job!!! Its amazing when you can do it yourself and I think the rewards for hard work is more enjoyable than just dishing out money for someone to do it for you. GREAT JOB,looking forward to your next project. You made great design choices and it looks so open and inviting and classy. I love the subway tile too and will want the source. 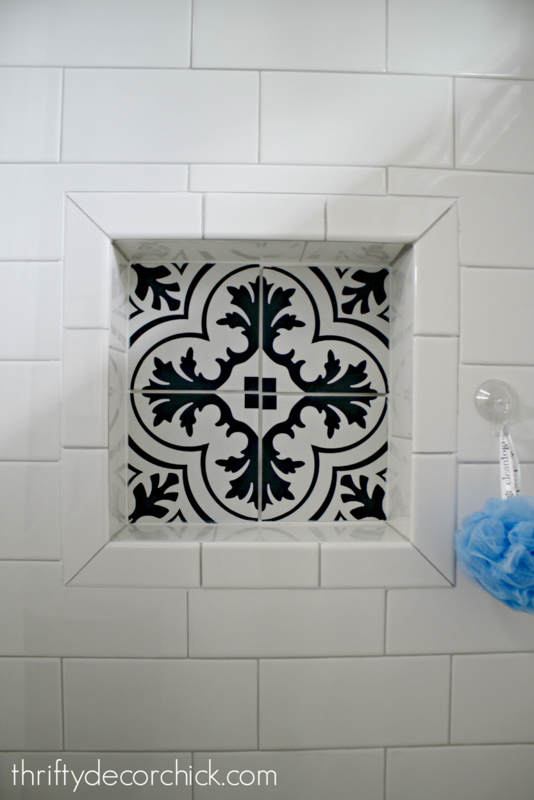 How did you choose the vanity tile? So unique and is the wow factor. It all came together and I'm glad you chose not to add the wall treatment. Doesn't need it!! Soooooo lovely! 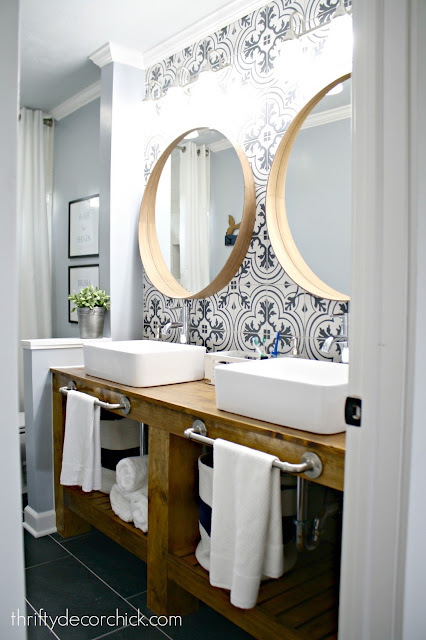 I really like the towel bars in front of the vanity and the tile in the whole room. 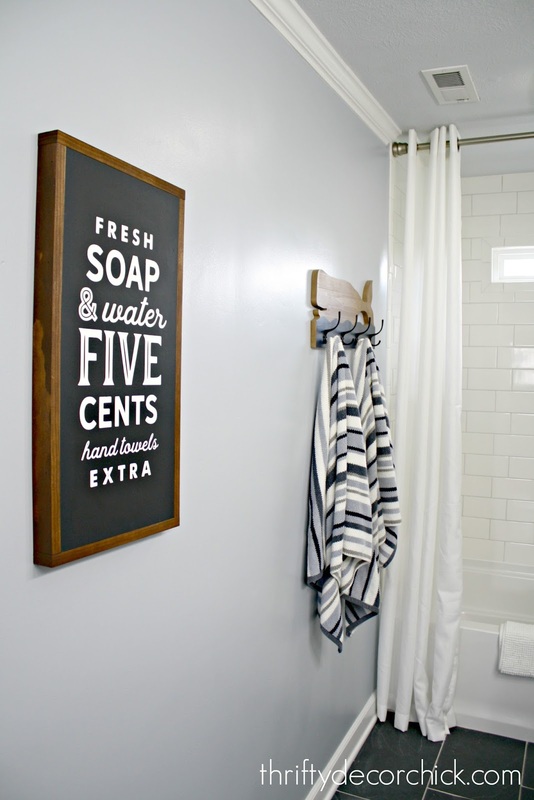 They diy vanity is perfect for the space! This is by far one of the most amazingly, gorgeous bathrooms that I have seen in one heck of a long time. I absolutely LOVE THIS!! It is GORGEOUS!! Yes, truly, truly amazing! Fantastic job....all of your hard work truly paid off! Oh my goodness, this is beautiful, I've been waiting for this reveal and you did not disappoint. 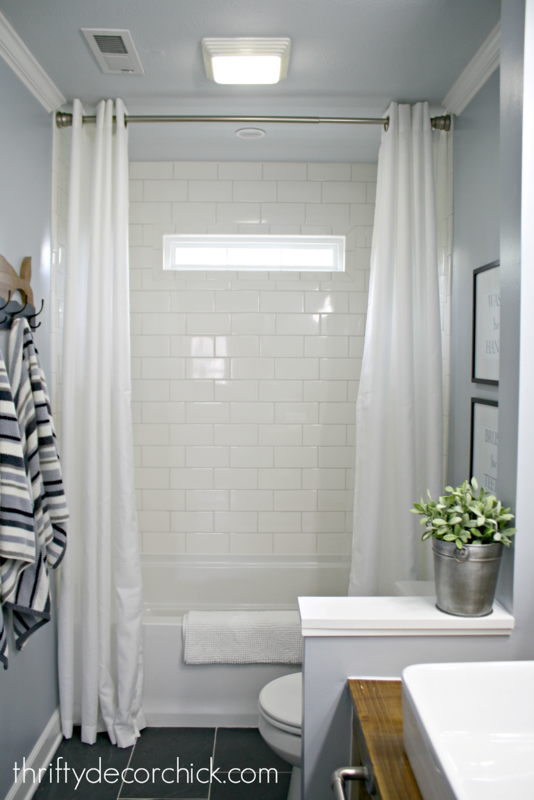 After your kitchen reveal, I knew this bathroom would be a showstopper. Stunning! You did a fantastic job on the reno! I love all your renovations and the "journey" to get there! I didn't think you could top the office, but this just might! It's so perfect, Sarah, I think there will be a lot of people copying your wonderful design! Congratulations on a job well done! Your new bathroom is amazing ! It's giving me inspiration ! Love, love, love that tiled wall. Wow, I just love this reno. I'm also wanting to update our guest/boy bathroom and this gives me so much inspiration. All in all about how much would say this cost you? I'm not going to be taking down any walls but maybe replacing our tub, add subway tile, new vanity. Words cannot express how amazing this is!!!! Great job!!!! Ohhhhh Emmmmm Geeeeee!!!! It is FABULOUS!!!! Love how you did the shower curtains. One on either side. I haven't seen that before. Also love the towel bars. Beautiful space. Very well done. It looks just wonderful...what a transformation! 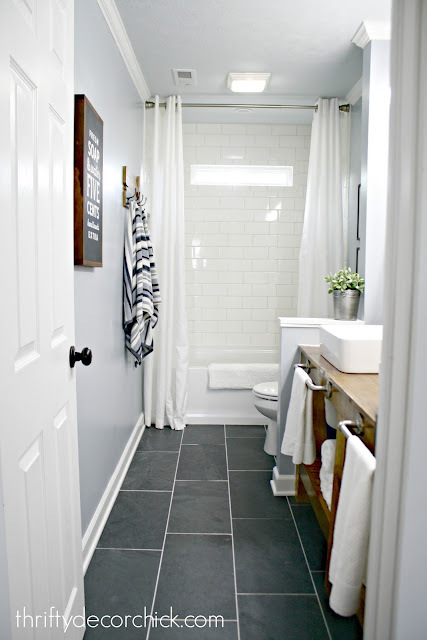 I love the backsplash tiles and the little touch of including those tiles in the shower nook as well. I'm curious about the placement of the towel bars. Do they get in the way of leaning over the sink to brush teeth? I'm short, so it seems like those bars protruding off the front might make it difficult to reach the sink. Oh wow!!! IT IS BEAUTIFUL! That tile and that wooden vanity and that subway tile & niche. Just everything. Great work as always! Such a big difference and I love how that little wall adds separation and privacy but opens it up so much! Sarah--It is absolutely stunning!!! LOVE it all and the fact that you did most of it! I love the tile back to the sinks and that niche--HELLO! And the subway tiles look amazing. All of it is gorgeous!! I love it !! It looks amazing!! Holy mackerel! It's so gorgeous! 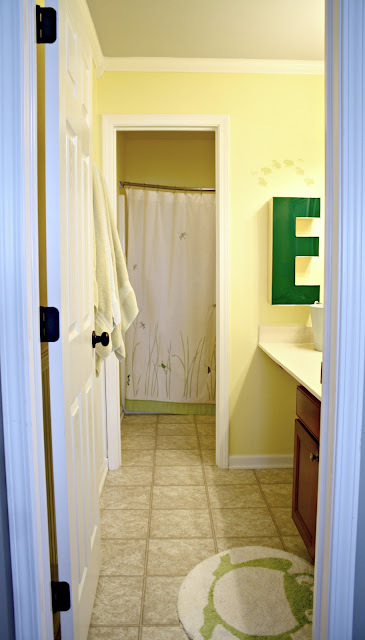 I came to your blog today to look up your kitchen sources, in preparation for painting our cabinets exactly like yours this week (we already got your countertops), and now I have to copy your bathroom too! Thanks for so much inspiration! Great job!!! 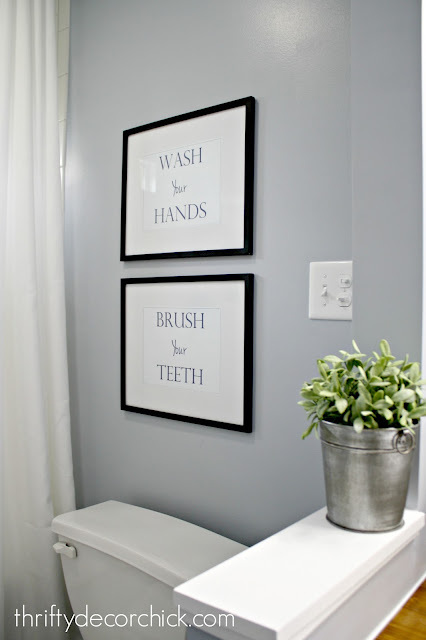 Very inspiring for my son's bathroom! I love the shower curtains. Do you leave them open on a regular basis? Are they a special length? love them! Gorgeous, Sarah. You have every right to want to go in and look at it... as much as you want. :-) I think it was a VERY good idea to not do a wall treatment on the main wall. It all looks beautiful! Just stunning! I am truly bowled over by your talent, energy, and design expertise. You are an inspiration to so many. 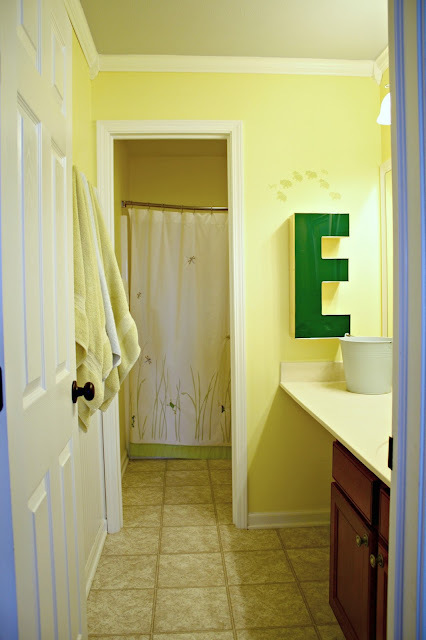 I love your bathroom and am in the very beginning stages of planning a similar remodel on ours. I never would have thought to do the pony wall, but I love the look. I'm sorry if this has been answered elsewhere, but what are the approximate dimensions of the bathroom. Mine is long and skinny too, and I specifically am wondering how wide yours is. Thanks! OH MY GOSH!!!!!!!!!!!!!!!!!!! I seriously love this bathroom - what a major change!! Absolutely gorgeous! !